Any U.S. K-12 school offering Japanese language education or local K-12 educational agency is eligible to host a J-LEAP Assistant Teacher—at no cost; there's even a $1,000 grant for materials. 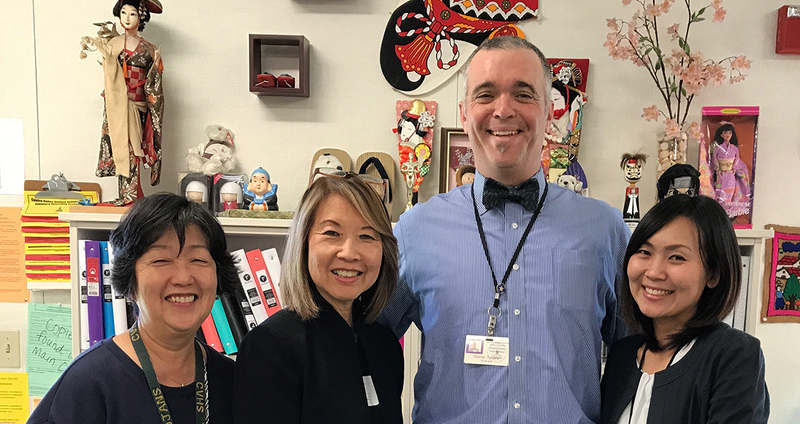 J-LEAP host sites are U.S. K-12 schools eager to expand and invigorate their Japanese language courses with the addition of a native Japanese language speaker. Assistant Teachers hold a minimum of a bachelor’s degree in Japanese language education, as well as either a Japanese language teaching competency certification or 420 hours of professional development for teachers of the Japanese language. As they adjust during their first three months in the community, Assistant Teachers are hosted by a local host family identified by the host site. This is a great way for the young Japanese addition to the community to meet folks outside of the school. After all, J-LEAP Assistant Teachers are also cultural promoters committed to engaging in local cultural events and activities. U.S. host sites also provide for the Assistant Teacher’s basic working environment, such as desk space and parking. Beyond these basic considerations, there is no cost to the school or district. J-LEAP Assistant Teacher compensation is fully covered by The Japan Foundation, and a $1,000 grant is even provided to each U.S. host site for the purchase of teaching materials and subsidization of Japan-related activities. Indeed, for schools and districts that are serious about boosting their language program and infusing significant cultural learning possibilities, J-LEAP represents an important and cost-effective opportunity. The most important role at the U.S. host site belongs to the Lead Teacher. Her or himself a teacher of Japanese, the Lead Teacher supports the Assistant Teacher during the program while benefitting from their assistance in the classroom. Armed with a desire to improve their team-teaching skills and their language program’s overall impact, the Lead Teacher is in many ways the J-LEAP catalyst for the community. Indeed, there is no host site application per se; rather, the Lead Teacher submits the application together with confirmation of administration approval. Learn more about this process in the application section of the Lead Teacher page.